Isha Ambani and Anand Piramal’s Royal Wedding Card is worth a whopping 3 Lakh! After a larger than life engagement that lasted for 3 days for Isha Ambani and Anand Piramal, one can only imagine what the wedding has in store. And if you were wondering, the Ambani’s have gone ahead and stunned the world! 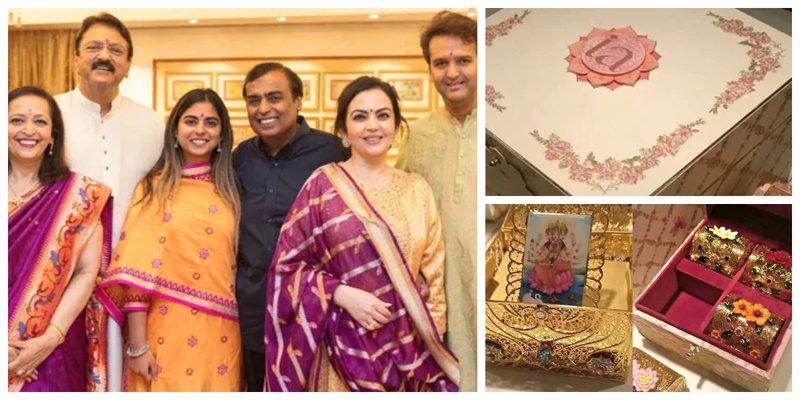 Isha Ambani wedding invite is royal than ever and if you were wondering what it costs, it costs a whopping 3 lakh! Yes, you heard that right. The invite contains the itinerary of the wedding functions and it also contains a box embossed with golden embroidery, which once opened, plays the tune of the Gayatri Mantra. Apart from that, there are four other small boxes as well with gifts, which looks like are made of gold. "The invitation for the wedding of Isha Ambani and Anand Piramal is an exquisite expression of values, culture and tradition, invoking the blessings of Gayatri Maa. Stunning and delightful, the invitation radiates warmth, love, and thoughtfulness in every layer! Isha’s emotional handwritten note, on her and Anand’s behalf, is an ode to their beloved grandparents – whom they call their greatest role models! Isha and Anand miss their grandfathers and fondly remember them - Motapapa Dhirubhai, Nana Ravindrabhai, Dada Gopikishan Piramal, and Nana Niranjan Shah. They feel truly blessed to have all their four grandmothers with them for the wedding celebrations. In a heart-warming gesture of love and deep respect, Isha and Anand have dedicated a flower to each of their grandmothers – the Lotus to Kokila Mummy, the Hibiscus to Purnima Nani, the Rose to Lalita Dadi and the Frangipani to Arunika Nani – symbolising virtues of purity, positivity, passion and prosperity. To celebrate this new beginning, Isha and Anand seek the blessings of all their elders, as they embark on this most special journey of their lives together." Through their wedding invite, the soon-to-be-married couple has dedicated a flower to each of their grandmothers – the Lotus to Kokila Mummy, the Hibiscus to Purnima Nani, the Rose to Lalita Dadi and the Frangipani to Arunika Nani – each flower symbolising the virtues of purity, positivity, passion and prosperity. While Isha and Anand’s wedding promises a lavish affair, their wedding card is reportedly worth Rs 3 lakh, as per a Hindustan Times report. Isha and Anand are all geared up to tie the knot on December 12, 2018, at former residence, Antilia, while the pre-wedding festivities will be held a week before at Jodhpur.